Anthony Azzopardi has formed a formidable team, headed by Zambora Brockie, heading in to next Saturday night's Group Race Finals at Wentworth Park. Zambora Brockie, the 2015 Ladbrokes Vic Peters Classic winner, recorded fastest of the night figures, stopping the clock at an impressive 29.60, leading all the way after exiting box one in the fifth heat of the Group 1, Ladbrokes Paws of Thunder. Azzopardi opened his account in the first heat on the night, with Asa Flying Spur upsetting more favoured runners such as Melbourne Cup winner, Dyna Double One. Asa Flying Spur went and stride for stride battle with Magic Spring, winning by just over length in the end. Azzopardi also had Group 1 Sale Cup winner, No Donuts feature on Saturday's (January 9) racing, winning the first heat of the Group 2 Summer Distance Plate. The victory by the new comer to the Londonderry kennels was impressive clocking 42.42. The tightly contested event saw No Donuts challenged by Ryno's Raider and Whittaker on the line. 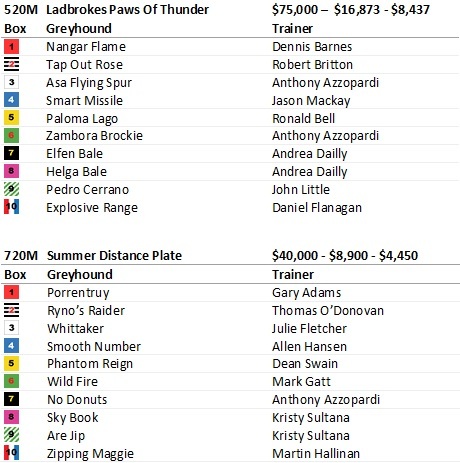 Victorian trainer, Andrea Dailly, also qualified two finalists for the $75,000 to the winner, Ladbrokes Paws of Thunder final, with Helga Bale winning by just a nose over Good Odds Ocker, while Elfen Bale beat home Chevy Prince in the third heat. The Group 1 final has also drawn a host of NSW runners, with Smart Missile (29.89), Nangar Flame (29.77) and Paloma Lago (30.17) all winning their respective heats. Robert Britton topped a good night at Cranbourne, with Tap Out Rose winning heat six in 29.96, in a huge thrill for connections. Two heats of the Group 2 Summer Distance Plate supported the Ladbrokes Paws of Thunder, with No Donuts, taking heat one, while Sky Book for Kristy Sultana won the second heat. Both events drew together a host of quality runners, with Sky Book beating home Wild Fire, Smooth Number and Phantom Reign in 42.75.